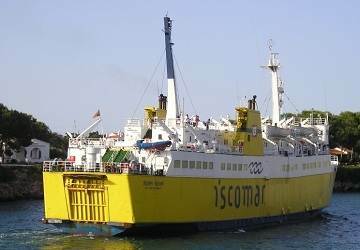 This ship is no longer operated by Iscomar and is now with Trasmediterranea. Nura Nova is a recent addition to the Trasmediterranea fleet and can carry up to 377 passengers and 86 cars. 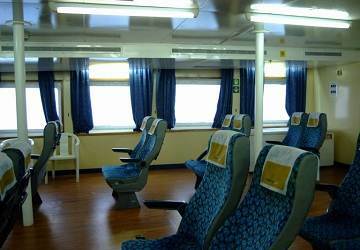 Onboard you’ll find plenty of services such as seating lounges, a restaurant, a cafeteria, snack dispensing machines, a multipurpose lounge, pet kennels, sun deck, medical services and a play-room for children. Due to the short duration of the crossing, there are is no cabin accommodation on offer. The reserved seats are arranged in rows of 2. You’ll be able to relax during the crossing as the seats are reclining and the lounge has windows so that you can enjoy the breathtaking views. Grab a bite to eat at the ship’s cafeteria. 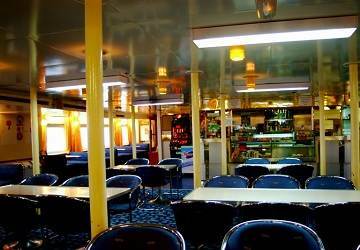 You’ll find a selection of soft drinks, alcoholic drinks, cold and hot snacks and ice creams. There’s also a restaurant with a wide selection of food and beverages. 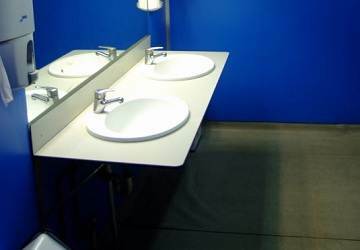 You’ll also find dispenser machines for snacks and sweets that you may use at any time. You’ll be able to enjoy a relaxing stroll through the ship’s decks or, if it’s a sunny day, top up your tan in the outdoor sun deck. Children are well catered for onboard the Nura Nova and can pass the time onboard in the ships play-room, which features soft toys and children sized furniture. Excellent experience wih kind staff and no so many people on board, not busy areas like cafès, and deck to breath a little bit of fresh air. Ground staff and on board very helpful and kind. We took the ferry over to visit friends in Menorca. The ferry was punctual and staff were friendly. We sat outside both ways and really enjoyed the trip. The ferry is old and noisy but this made it more charming. Kind staff at the ticket office, good crossing. You should change the ruiun and old carpets and repaint the walls. a lovely 2 hrs sunbathing on deck drinking cafe con leche an eating tasty serrano ham an cheese boccadillos! We make the crossing Alcudia-ciutadella at least one time per year, but we had not done it before with ISCOMAR. 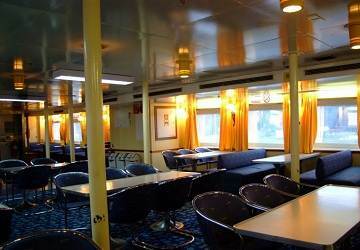 The staff is very kind and friendly, facilities are confortable and boarding and disembarkation very fast. 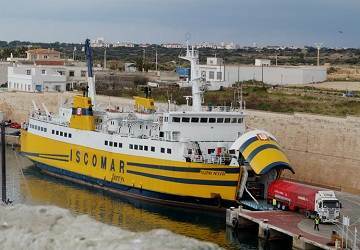 Next time we will look for at first option for Iscomar ferries. 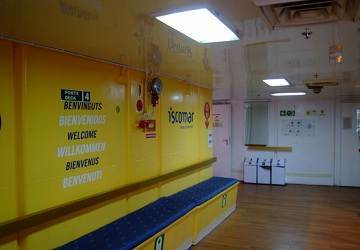 the iscomar ferry are basic bu clean with a very kind crew.The travel was very nice. It was a pleasant trip, although there were high waves and bad weather on the first trip. The staff handled it very well though and made sure everyone was alright. Great! You can buy snacks, drinks and sandwiches on the ferry which was ok, neither great nor bad. You need cash for this! "Alcudia to Ciutadella by Iscomar Line"
We travelled as foot passengers from Alcudia to Ciutadella on a afternoon sailing. There seemed to be very few passengers on board which made the trip very relaxing The office and ship staff were very helpful and facilities good. Thanks to the helpful staff at Direct Ferries who quickly sorted a problem when the online booking failed. Would happily use this service again The terminals at both ports are great. A temporary baggage storage area at the terminal would be helpful. None was available and after checking in 2 hrs before sailing we had to take our suitcases back into nearby Alcudia with us until boarding time. "helpful staff in the ferry"
There was a restaurant on the ferry where the staff was very friendly. One of the gentlemen among them (he was a bit older than the others, or looked like he had a long experience), was of special assistant with everything we needed and I think the company is lucky to have him onboard. "Ferry from Alcudia, Majorca to Ciuadella, Menorca"
Nice trip staff very helpful, shame you can not park at the ferry terminal loads of empty space but you have to drive round the back streets of Alcudia looking for a parking space. We booked a crossing on Friday 25 April 2014 at 4pm. We were informed on the 24th ot noon that the crossing was cancelled because of the weather. We had to cancel an hotel in Ciutadella (49,96 €), but too late to be refunded. We had to book another hotel in Alcudia (100 €) Result: 150€ extra Apart from that, the crossing went well. Overall it was good. Good line service and the timetables were more or less acceptable. If I had to do it again I would do it with directferries.